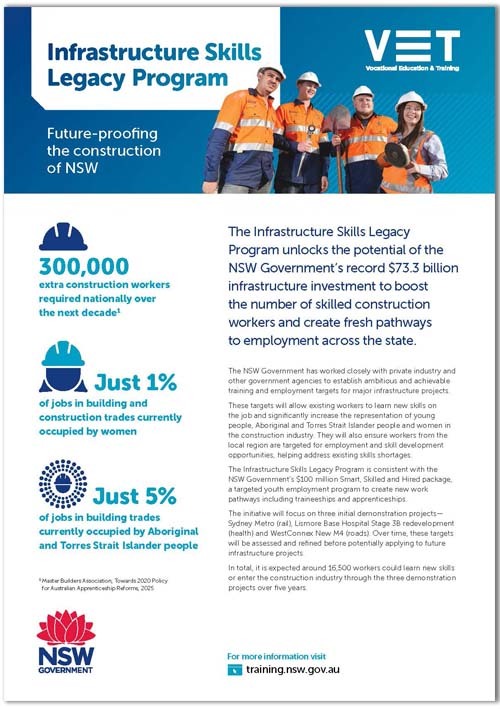 The Infrastructure Skills Legacy Program (ISLP) will capitalise on the NSW Government’s record levels of infrastructure investment to boost the number of skilled construction workers and create fresh pathways to employment across the state. help address existing skills shortages across NSW. strategies to ensure projects employ and train people from the local region. Civil construction projects by their specific nature offer a specialised set of skills training opportunities and therefore may consider a target of 10% of their total labour cost, subject to individual project requirements, applied to apprentices and learning workers combined. Skills shortages occur where there is insufficient availability of skilled workers to meet the current and emerging needs of industry. They can create critical short term and long term problems for the state’s economy. Forecasts suggest an additional 300,000 construction workers will be required nationally by 2024. The combined trends will result in a significant shortage of skilled workers if unaddressed. The ISLP is an important component of the NSW Government’s efforts to address current and emerging skills shortages across NSW.